The Luxman Vintage Website and the Tannoy Monitor Gold Website are about famous vintage products, but also about the continued use of good quality products. of audio and other electronic gear that breaks down after approx. 2 years of service and the reviewers that promote these products. The nonsense they tell you about todays modern audio gear and their use, telling things that are simply not true, and that this has become general practise. the notorious surround rot, an issue caused by Tannoy that used to make wrong decisions about parts properties, aging research and pricing policy in the 1980 's. 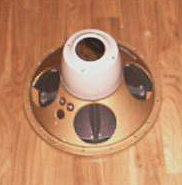 A typical design and component choice error made by Tannoy (HK at the time). 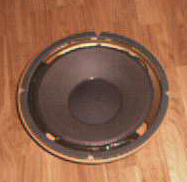 Tannoy HPD 315 with rotted surround. But not only by Tannoy as you will see below. Very often however it is not a design error as Tannoy made, but planned obsolecance that causes the break down of a product. break down after a planned period of use by the customer. After the breakdown the manufacturer offers no service and so the circle is round: the user buys new. This planned obsolecance got introduced in the 1950's in the US and not much later in the whole world. in chip counters, and many more. It is usually quite easy to determine what a manufacturer has in its design planned for obsolecance. 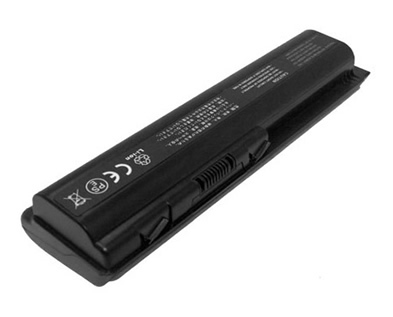 with the power supplies and batteries of cell phones, ipods and the cartridges problem of printers. Should you be aware of the planned limited life of the things you buy? Do you want to pay for planned obsolecance? Or do you not care? 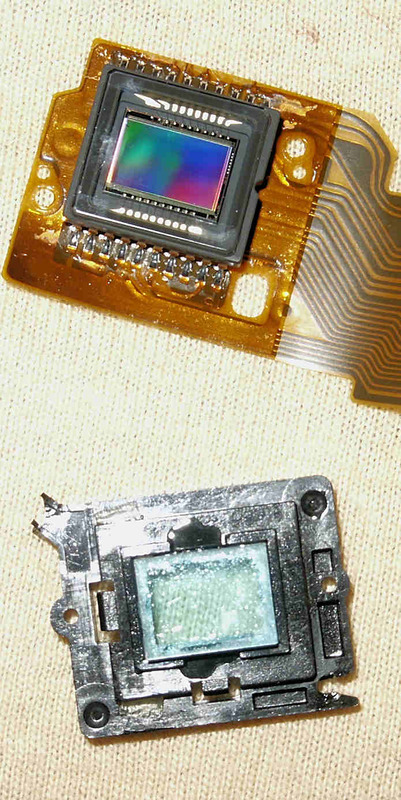 the repair of defective gear. The 2nd hand product is popular again and on the internet there are many websites selling used products. Many people are updating old gear to get their stuff up to modern standards, without buying new stuff. they are keen on getting their gear repaired and are helping each other in a friendly and productive concept. Below a few typical examples of this planned obsolecence phenomene. Cheap building practises by an English amplifier manufacturer. and slick build, good transformer, no comments at first glance. 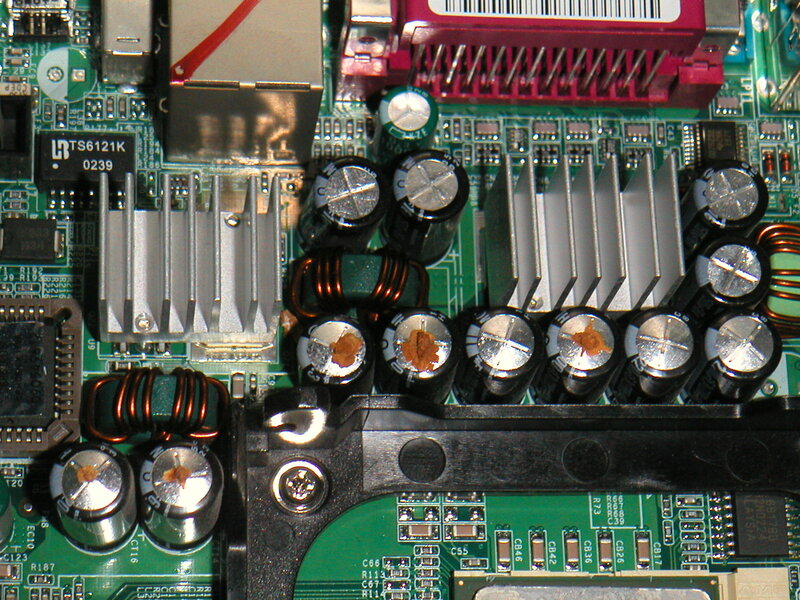 An example of cheap heatsinking by an amplifier manufacturer, this way of heatsinking is not without consequenses. This is a photo of the driver transistors and how this manufacturer thinks about heatsinking. The drivers have some fin that breaks off easely and the power transistors are screwed to the bottom of the box. have better temp. properties than pure discrete parts, it is also a way to cut costs and be sure life of this product is limited. 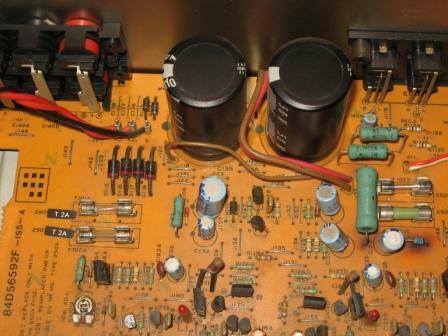 Problems that you find in ALL Luxman amps of this L200 series model. 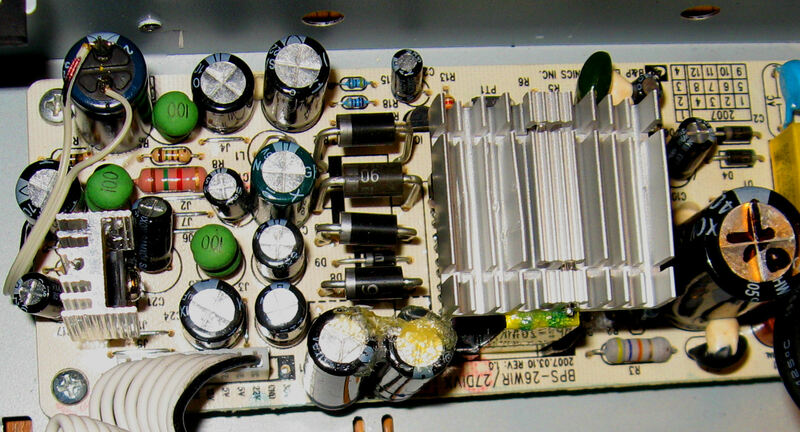 Burnt pcb in a Luxman amplifier L230. on the left side of it and this gets up to 90 deg. C. Resulting in a breakdown of the capacitor and the complete lamp-circuit. Now the amp is out of order and does not work anymore. An upgrade of the circuit is neccesary as the power design has to be changed. 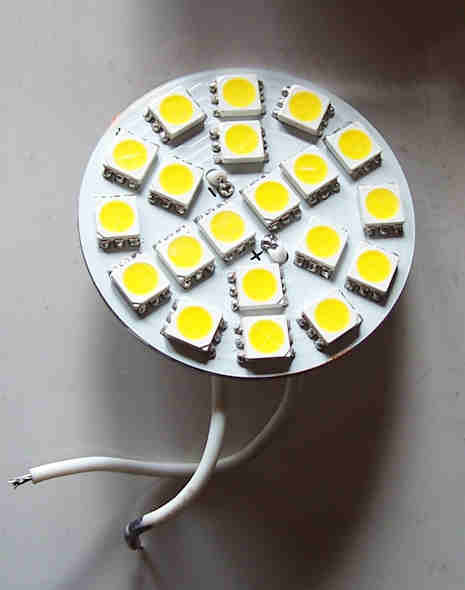 Changing lamps to leds is best done here, all problems are solved when this is done. Strong, how strong? strong lasts 3 years and after that its not so strong? 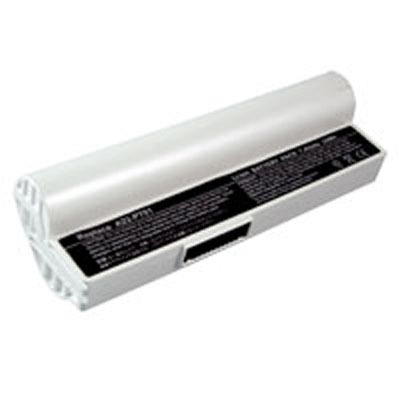 The same problem is found in many switching power supplies of audio and multimedia gear. that it breaks down, it makes the reciever obsolete due to too high repairing cost. I have measured the temperature of the parts in the involved power supply and got values above 80/85 deg C.
Heatsinking these parts helps but does not solve the problem. I had to add diodes, capacitors and heatsinks to get temperatures under control in this reciever. 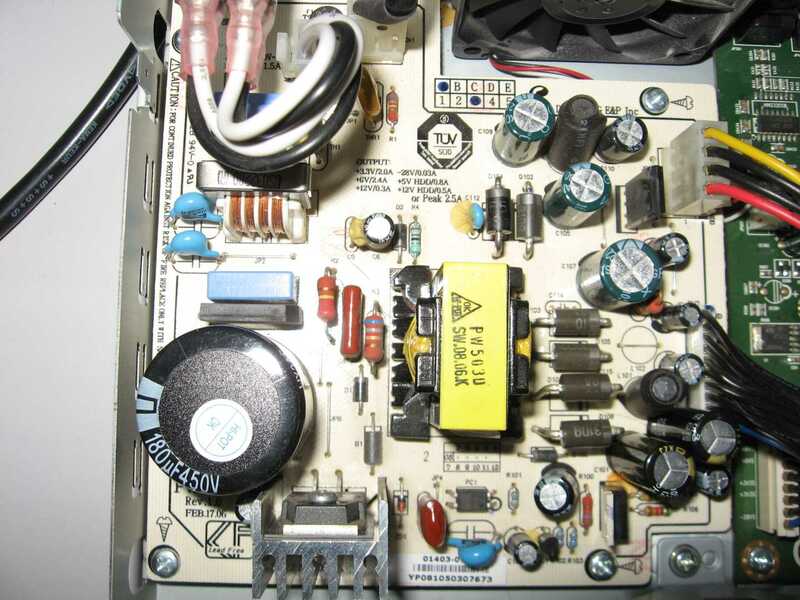 The modified power supply of this reciever shown below. and are fast switching shottky diodes, now the temp. of the power supply is around 60 deg C, even after a long operating time. Updated power supply unit, initially suffering high temperatures exceeding 85 deg C. causing an early death of the reciever. Electronic parts temperatures of up to 60 deg. Celcius is an average value that not should be exceeded in electronics. Many manufactureres are not worried when their product power supply measures above 80 deg. C. at normal daily use of the equipment. the equipment is obsolete, high repairing cost after a short life does not make the customer happy. making this receiver unable to receive HD broadcasts properly, and HD is what this receiver is designed for in the first place. After 3 years of use its in fact obsolete, what do you think should the user buy a new receiver because of this? For this Medion pc motherboard power supply section all help came too late, the unit is dead. 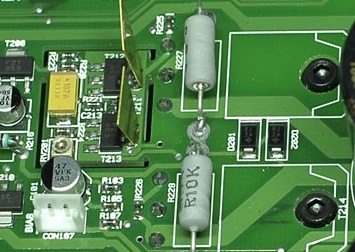 Another problem that is by now quite common: blown capacitors. Not only in pc's but also since ~1980 in audio gear. after little more than one year of use. This obsolecence policy by Medion is completely unacceptable. As this is a serious design and component choice error made by Medion. This again underlines the planned obsolecence policy of several manufacturers, the result is: the customer never again buys Medion. The Humax problem, as many customers are convinced this is the best you can get, but is it the best? Above a Humax reciever with problems making it obsolete? This is a cable reciever version with internal harddisk. 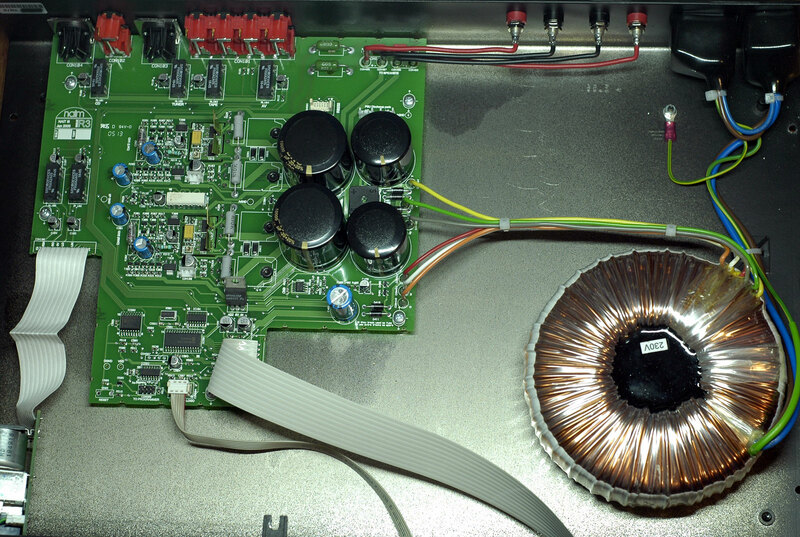 The Humax recievers are notorious for the bad quality of their power supplies. Here you see a Humax powersupply that has broken down and repaired and updated. The problem was that some capacitors exploded. 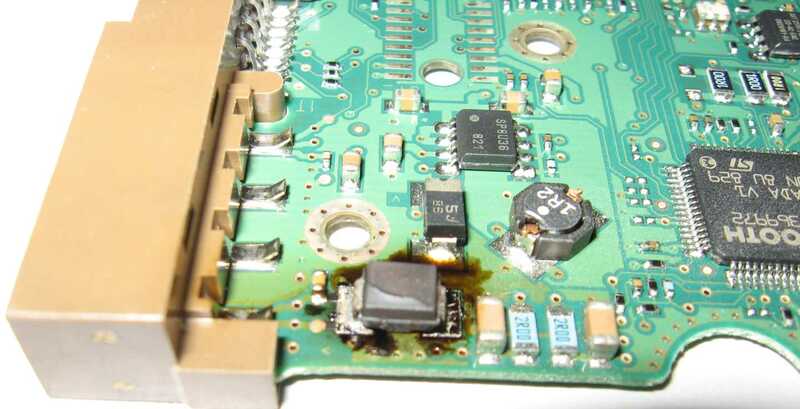 The diode was after all not capable of handling the exceeded voltage and current coming from the bad power supply. Too early to call it obsolete after a few years of use? The repair would cost around $100, plus a replacement harddisk. on other camera models, so the question is how long should a digital camera work properly? 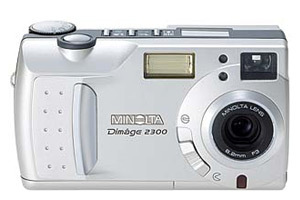 Minolta was bought by Sony, have they solved the problem? The blurred colour filter making the camera useless. 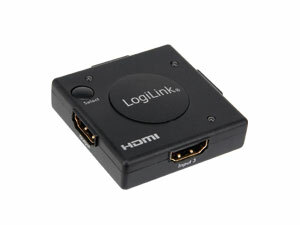 the HDMI standards, that makes it unusable and worthless. 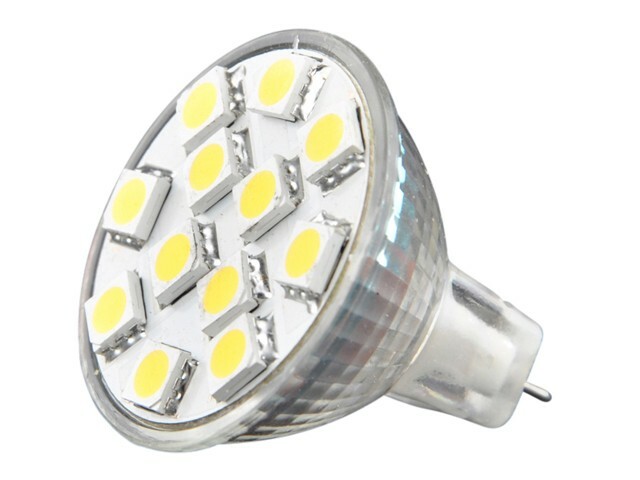 Led lamps build quality and the life of 10.000+ hours claimed. 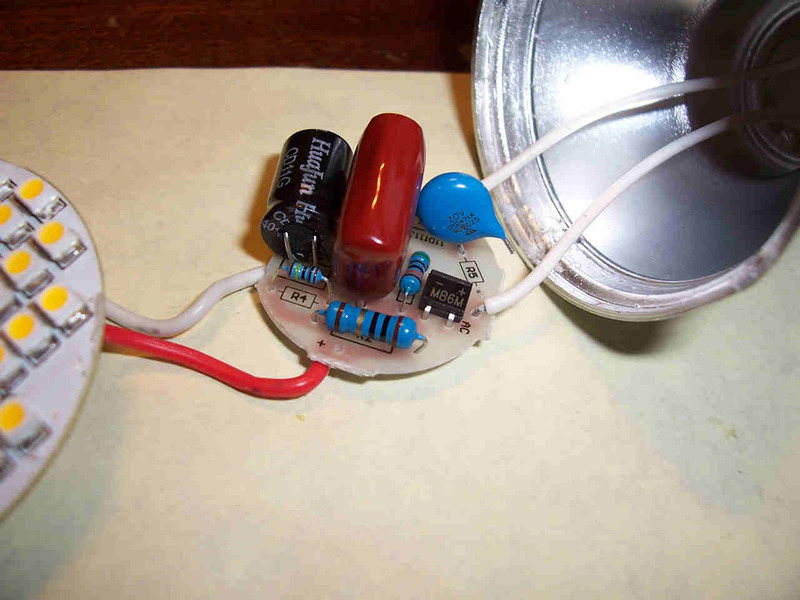 This is a led-lamp cracked and you see the power converter-pcb and the led-pcb with the power leds. 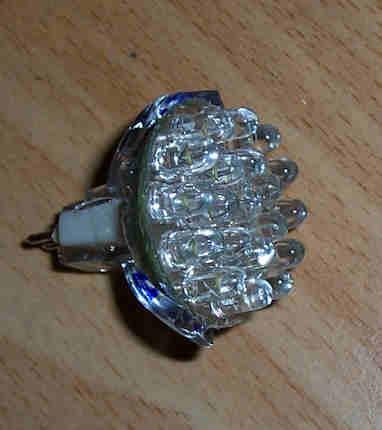 The ledlamp above broke down after less than 10 hours of service, as you can see the blue resistor R5 got disconnected. 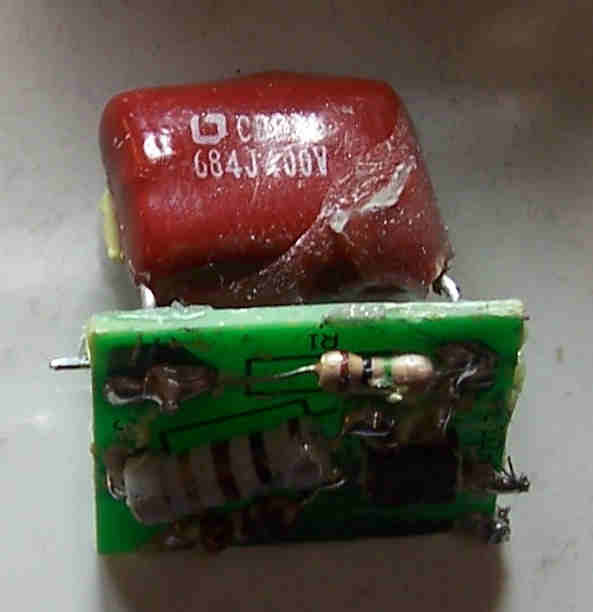 is that the resistor in front, R2 of 10 Ohms is defect, it is intermittant and had an average resistance of 80 KOhms. of the same bad quality? Will you get your money back? 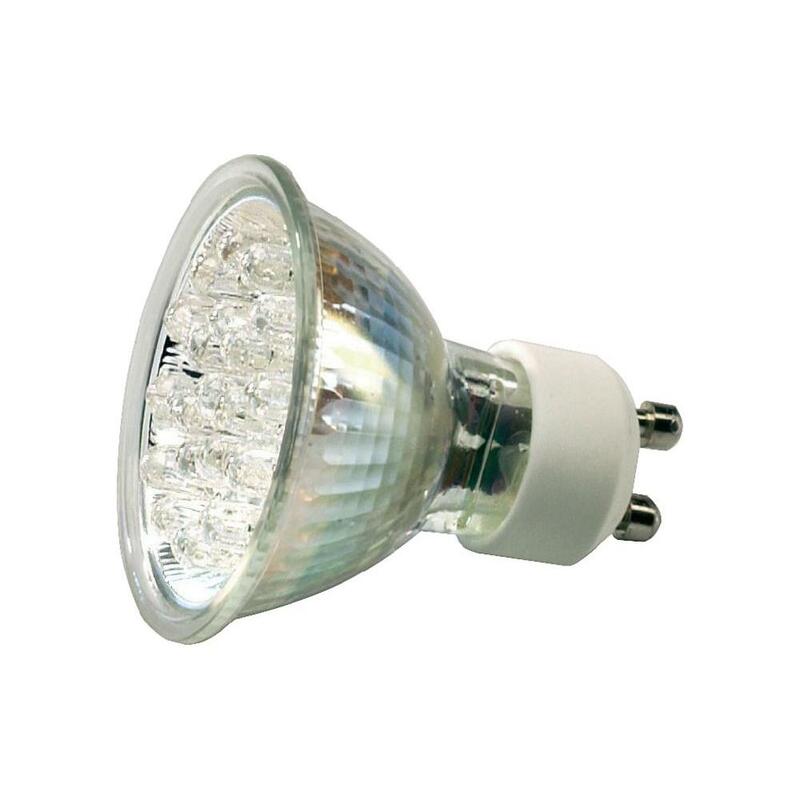 The today sold ledlamps are now building up a bad reputation, is it too early they are getting the label: notorious? but also because there is only one way to discribe the light stream: in Lumen. their ledlamps are in Lumen. leaving customers in the dark about their products. fluorescent lamp has never been what they promised, that leaves us the ledlamp that is getting a bad reputation already. 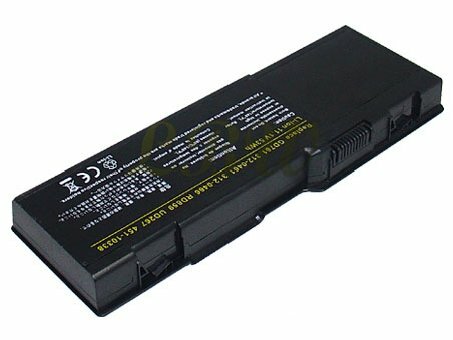 Than there is the Laptop Battery, that is really a costly problem for the customer that buys a laptop in good confidence. I did and expected my laptop to last for say 4 years, NOT!!! Most batterys break down after a year of use. as they are as good as the most expensive replacement. 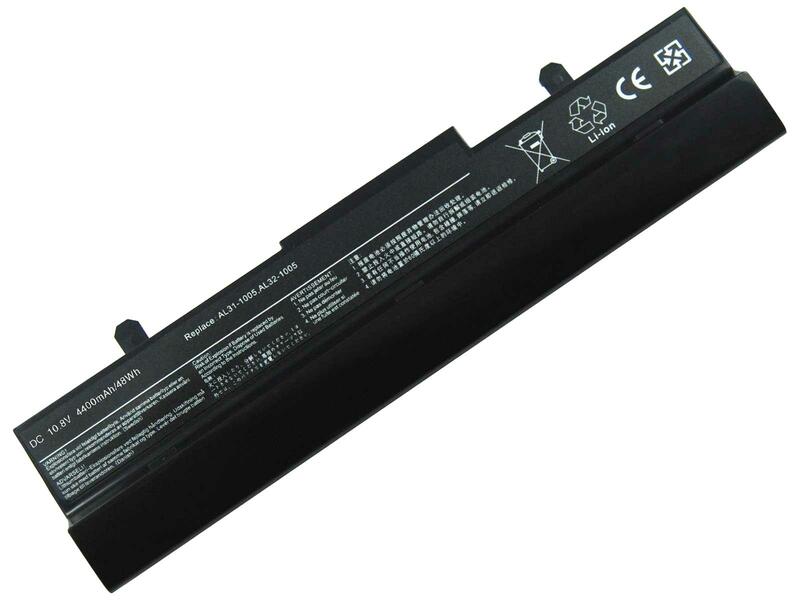 For my Asus Eeepc the replacement costs $65, I bought a $25 battery from a German supplier, ist ok! it did even come with a user manual, and ist as good as the original HP. even the original Dell expensive replacements died within the year. 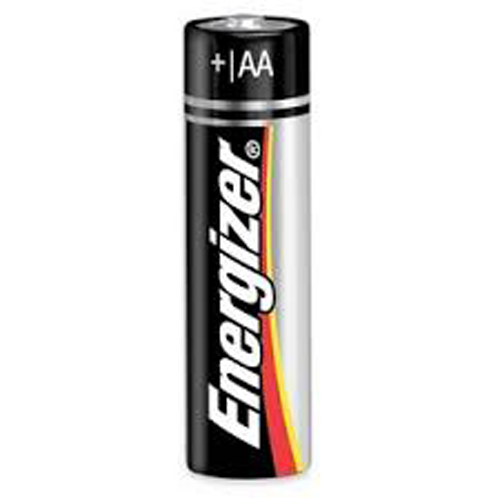 and all these brands: they never succeeded in making a non leaking battery: AA, AAA. 9V etc. etc. they all leak!!!!!!!!!!!!!!!!!!!!! Many of my gear is broken by these scam batteries. I will always put leaking batteries in the waste bin and never offer them for recycling: there is simply nothing to recycle: its a scam!!!!!!!!!!!!!!!!!!!!!!!!!!!!!!!!!!!!!!! Thank you idiots for breaking my gear. Did you know that less than 10% of the obsolete products are recycled or reused? there are no such controls. Recycling is done by hand in scrap yards, often by children. photo: Scrapmonster, text part: Greenpeace. What side are you on? The customer side or the producers side? 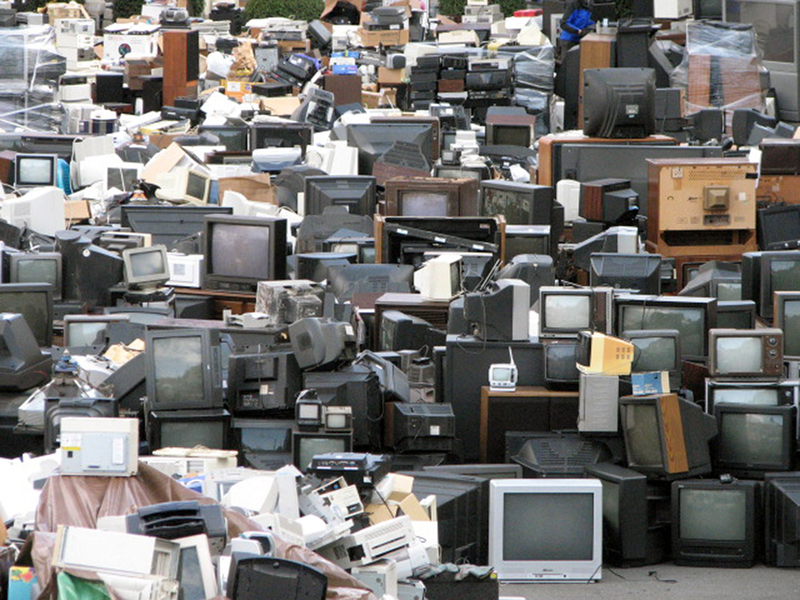 How do you look at the waste caused by so many obsolete products? Did you know: You can make a difference! Under construction, to be continued. � PE1MMK Hans Hilberink, last update: 14-05-2017.